I hearby declare myself the slowest quilter / sewer ever. Anyone wanting to beat me for the title, tell me why and maybe I’ll deem it to you instead. 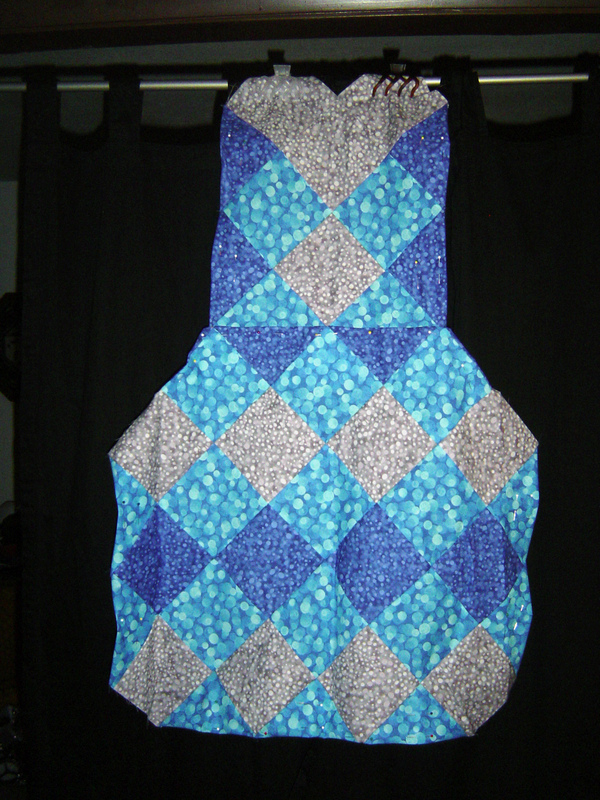 The summer I first started quilting, in summer of 2009 I wanted to make a quilted apron. Apron. You know, the fast and easy project, that saves you from water splashes when you’re doing dishes? Jean was making them sound so lovely too! First the end result after 2 years … nothing to get all excited about, nothing all that special or particularly complicated. Yes, I know, I coulda put the strip (apron ties) on the inside, but I finally said, I’m going to sew it down on the outside and get this thing done. You want to see the apron journey that took over 2 years? First it started with a pattern and some fabric – dotted fabric! 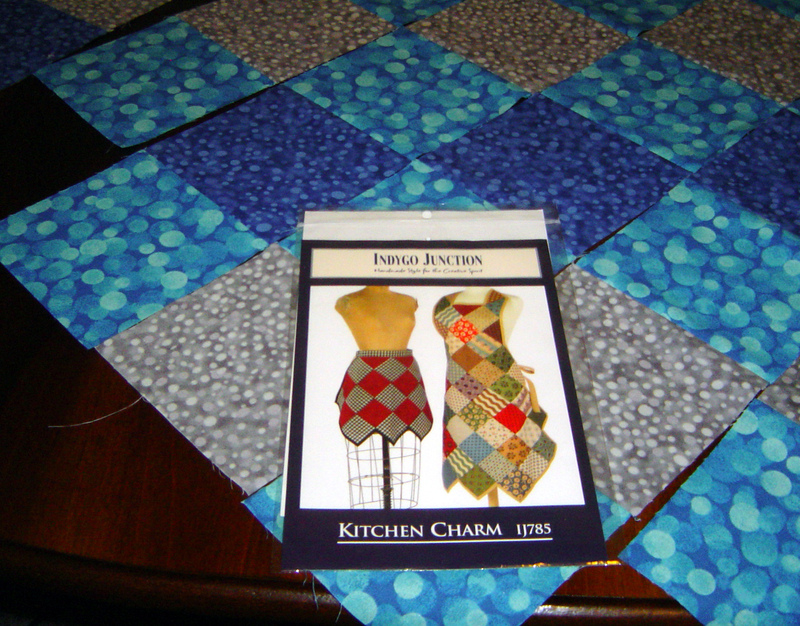 You can purchase the apron pattern from Indygo Junction to give yourself a patchwork full or half apron (two other options for finishing on back). 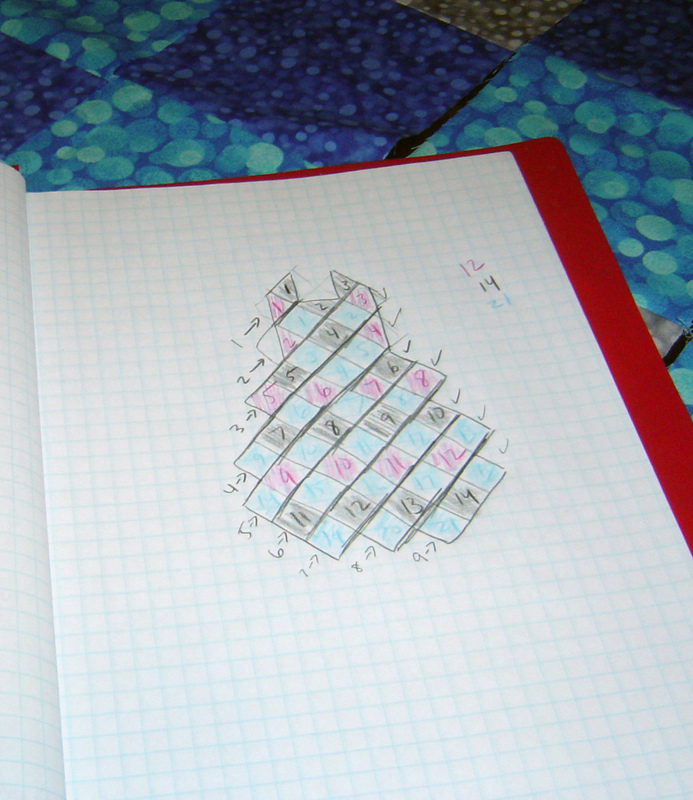 And then it started with a color combination on graph paper. 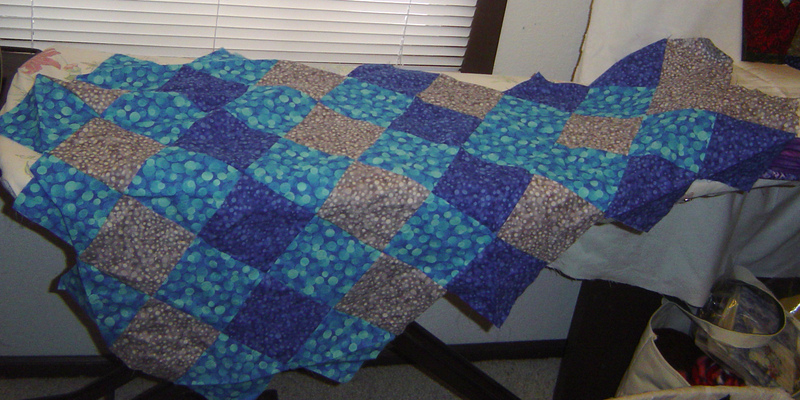 (this was all done in august of 2009, but the fabric & pattern was purchased closer to may 2009). I counted out the squares and set to make an apron, not reading the part that this uses 4 inch squares rather than 5 inch squares. And I sewed the thing up, I went in diagonal rows as you can see from the diagram, a little ‘on point’ quilt if you would say that. Sadly, at this point, it appears I didn’t get a picture of the monstrosity at this time, so here is a picture I took much later (feb 2011) of the entire apron as made. You may remember a post about sawing a woman in half, that’s this apron. But back in 2009, I was going to fix the problem by folding up the apron in interesting ways, folding the edges which I didn’t like as much anymore. This created a fold in the middle, from the top to the bottom, which actually provided a little pocket. Not a bad idea for the pocket. But I still had to deal with the binding (at the time I was planning to bind around the entire apron), and I had to figure out how to back it correctly, so in a bag it went and stayed, and stayed and stayed. Then before retreat this February (2011), I was listening to a podcast about UFO’s and decided to cut the apron in half, (again see the post) and I got a walhanging and a smaller apron. I used my artistic licence to remove and add squares in various places. 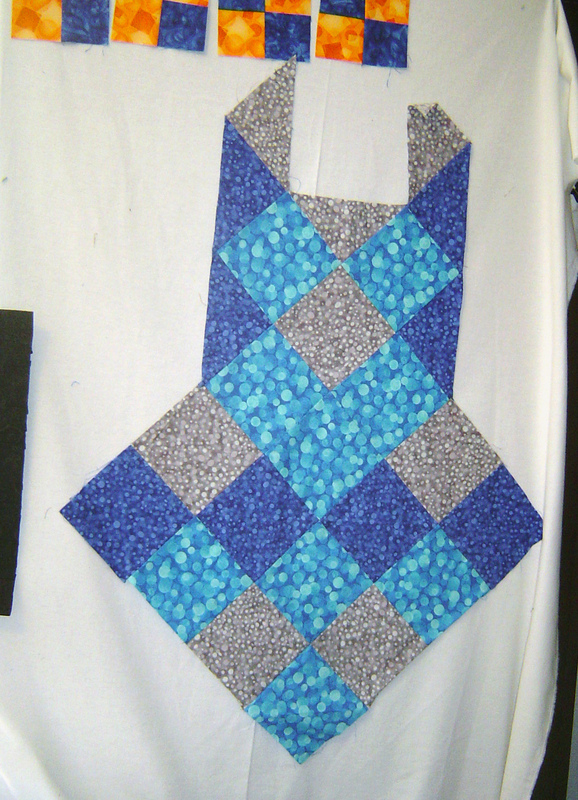 And I still have the wallhanging ready to quilt – it’s basted & everything. I am actually slightly glad I waited because now I can use my 501 quilt design book to actually quilt it. I remember waiting for hours (literally) at the car repair shop (while they had to drive 3 tires all the way from another store in another town) and at the time I was trying to draw icicles or something for quilt designs, and I gave up & started embroidering instead. I even prepared white muslin to go on the back of the apron, and pinned it all the way around. I took both to retreat, but didn’t touch either. Still the binding, & straps intimidated me, and what to do what to do, so put it away. 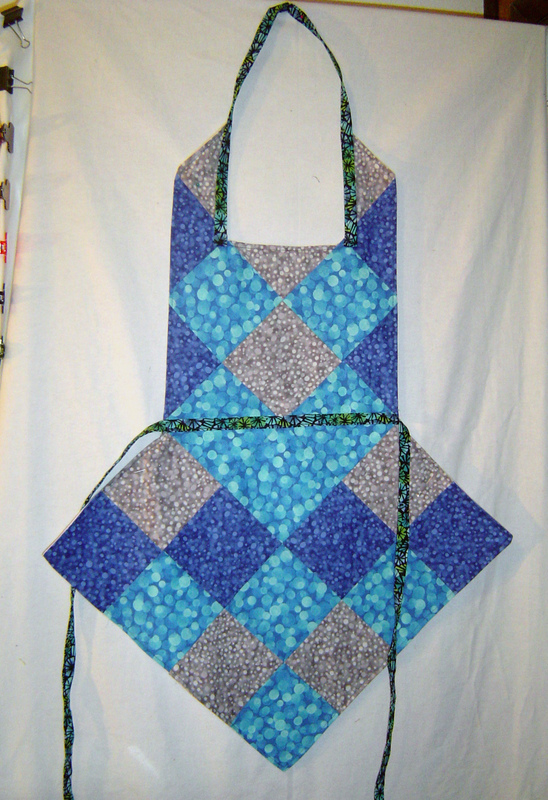 Then after KCMQG meeting, me & my friend are talking about getting projects finished, and I brought up this apron, we talked and talked a little bit, and actually bringing it to the front of my mind, gave me the push to get it back out. So last saturday, here comes the binding strip, sew it closed first, decide to put the binding outside for visual contrast on the apron, so I can sew down & birth the backing and the top of the apron. Top stitch around the edges to make sure the backing really doesn’t show up very much. Hang from my neck & pin the sucker onto my shirt to figure out how long to make the neck binding. Top stitch the binding down to the apron. Center the apron strings onto the quilt. Did not quilt the thing, it’s done done done. After more than 2 years. Simple project turned interesting long story.